Shirts With Random Triangles: Ohio St. Running Back Ezekiel Elliott Cited By Police For Driving With A Suspended License Following Automobile Accident. The incident took place a day before the Buckeyes left Columbus for Phoenix. Az. Elliott reportedly told Columbus police that he had lost control of the vehicle he was driving after hitting a puddle. This resulted in Elliott losing control of the vehicle as it hydroplaned. There are conflicting reports as to whether any other vehicles were involved in the accident. Columbus station WTTE describes the incident as a "one car crash." TMZ Sports, on the other hand, reports Elliott crashed the vehicle into another vehicle, leaving the other driver with "with minor injuries"that didn't require medical attention. 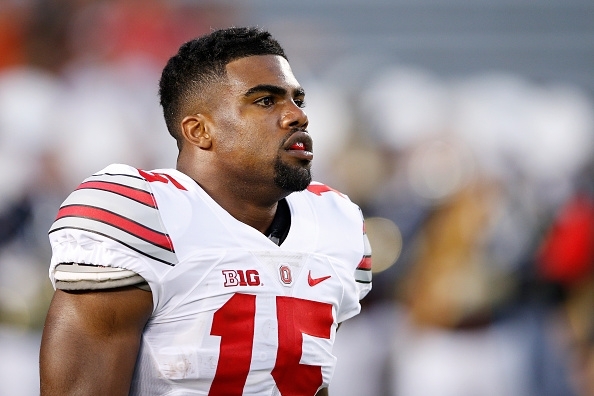 Columbus police cited Elliott with driving under a suspended license, operating a vehicle without a license, and "failure to control."